The Milwaukee 7, in collaboration with JPMorgan Chase, is offering the Export Development Grant Program to help manufacturers, companies selling a proprietary product line, and service-based companies grow in international trade. 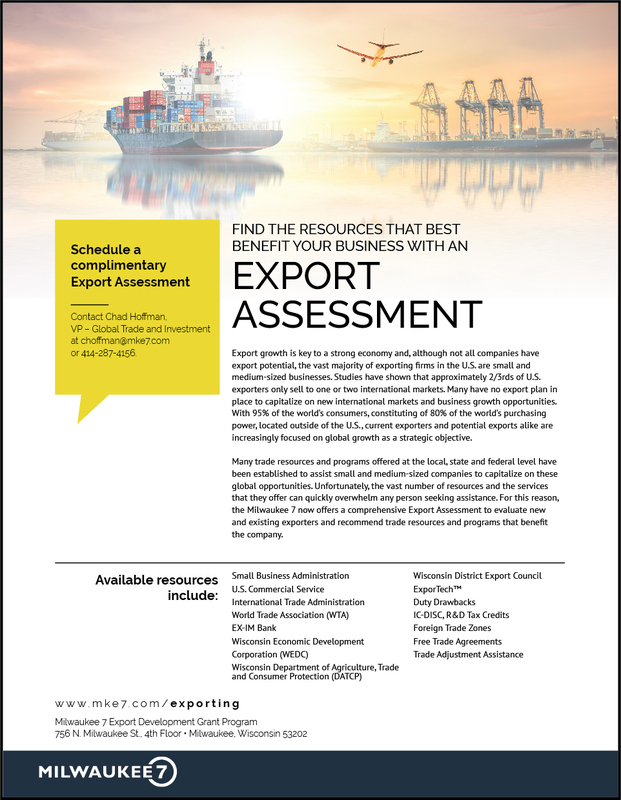 The Export Development Grant Program will award matching funds of up to $5,000 to companies in Southeastern Wisconsin, both new to export as well as existing exporters, to take advantage of opportunities in international markets and to overcome obstacles. Companies must be located within the seven-county region consisting of: Kenosha, Milwaukee, Ozaukee, Racine, Walworth, Washington or Waukesha. Preference will be given to small- and medium-sized enterprises (SME’s) with less than 500 employees. Wave 14: Application deadline March 31, 2019. Award notifications by April 30, 2019. Wave 15: Application deadline June 30, 2019. Award notification by July 31, 2019. Wave 16: Application deadline September 30, 2019. Award notification by October 31, 2019. Wave 17: Application deadline December 31, 2019. Award notifications by January 30, 2020. >>Frequently asked questions about the Export Development Grant Program. >>Complete the online application here. At the Wisconsin International Trade Conference, Brian Grossman, the newly appointed head of Middle Market Banking in Wisconsin at JPMorgan Chase, announced the bank is providing an additional $150,000 to the Milwaukee 7 to continue its Export Development Grant Program across the region. >>Read more.